Bahria Town is the largest private real estate company in Asia. Its management comprises of efficient real estate development professionals who knows how to deliver on time and in accordance with the international quality of standards. We already have proof of Bahria Town’s success taking into account the projects of Bahria Town in Islamabad, Lahore, and Karachi. The plots and villas in Bahria Paradise are available on the installment plan of 4 years which makes it easy for a typical man to invest in it. Least payment option is Rs. 3.30 Lac quarterly in 16 Installments. It requires down payment of Rs. 6.5 Lac. Bahria Town Karachi has kept the prices reasonable considering the location of Bahria Paradise project which is far better than Bahria Sports City. It is near precinct 16. Secondly, it is near Grand Jamia Mosque which is under construction and will be the world’s 3rd largest mosque. Another attraction is the replica of Taj Mahal which is expected to be phenomenal. Its construction will start soon after the inauguration. Furthermore, as mentioned earlier the plots and villas are on the 4-year installment plan. So it is pretty affordable. The peace, security and the state of art facilities in Bahria Town like world class Cinema, food courts, malls and stadiums have made Bahria Town an ideal residential society to live in Karachi. This combined package from Bahria Town offers best returns on investment. Coming to Bahria Paradise Karachi. If you are not planning to reside over there, you must consider it for investment. The price of 250 square yard plot is Rs. 59.25 Lac which is expected to grow after the launch and further more after the development work starts. Therefore, investing in real estate of Bahria Paradise Karachi’s assets is something that any potential investor will hardly say no to due to the promising returns it offers. Here are different options for investments in Bahria Paradise Karachi and you can adopt for any of them according to your budget and needs. Bahria Paradise Karachi plots investment is good for low to middle-income groups. The plot sizes range from 10 marlas to 2 Kanals. If you are a new investor and doesn’t know how you can earn a profit on this project on short term basis then this is for you. First, you should pre-book the plot as early as possible. Early buyers mostly get good location plots and Bahria Town gives them high priority. The advance booking of Bahria Paradise has already started at the price of Rs. 1 Lac. After the advance booking, you should wait for the project to launch. When the project launches, you can pay the down payment without worrying for prices variation. In this project least down payment is starting from Rs. 6.5 lac. This downpayment will be adjusted from your advance booking payment of Rs. 1 Lac. Keep the plot with you until its prices rise. You can either pay the next installments or sell it when the prices have gone up. From Where I Should Buy the Plot? This is the most important thing in this investment. Bahria Town does not pre-book the plot or even sometimes doesn’t sell it directly. All the assets are bought by authorized dealers and they sell to the public. Therefore it leaves you to dealers. It is always recommended to buy the assets from the authorized dealers of Bahria Town. Look for popular real estate agencies. For instance, you can buy from popular real estate agencies like Prism Estate & Builder or Berq Properties. To sum it up, the Bahria Paradise Karachi is an ideal investment opportunity for everyone. It is the most profitable and safe investment option in Pakistan. 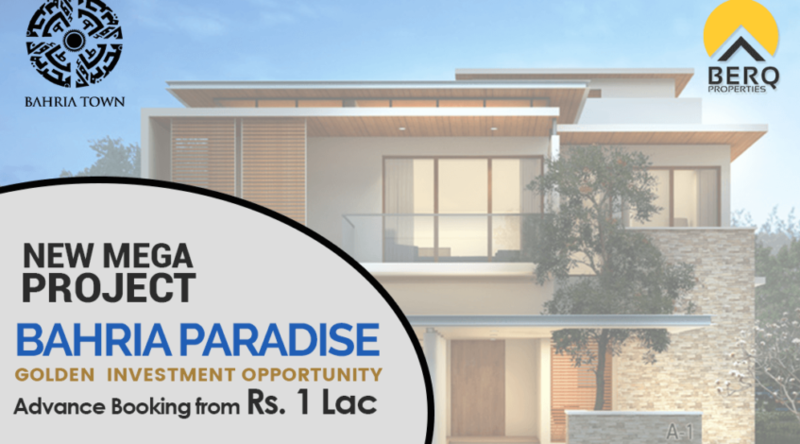 Apart from investment, you can even build your dream house in Bahria Paradise. Nice post . Can you guide me that should i wait for the launching of bahria paradise project or i go for advance booking . Bahria Paradise is by far one of the best projects of Bahria Town Karachi.